The Mercedes-Benz A-Class is a subcompact executive car (subcompact in its first two generations) produced by the German automobile manufacturer Mercedes-Benz. The first generation (W168) was introduced in 1997, the second generation model (W169) appeared in late 2004 and the third generation model (W176) was launched in 2012. The fourth generation model (W177), which was launched in 2018, will mark the first time the A-Class is offered in the United States and Canada. This fourth generation A-Class will also be the first to be offered both as a hatchback (W177) and sedan (V177). Originally produced only as a five-door hatchback in 1997, the second generation W169 introduced a three-door hatchback. In the markets where the A-Class is or has been sold, it has represented the entry level model for Mercedes-Benz. Having grown by 68 cm (27 in) since the original model, the 2012 third generation A-class was longer than the first-generation B-class. And although sometimes referred to by fans as the 'Baby Benz', Mercedes themselves actually use that moniker for the 1982 Mercedes 190 (W201), their first compact executive car model. In 1994, Mercedes-Benz confirmed that it would be launching a compact car - the A-Class (A 160) - by early 1997, which would be the company's first venture in this sector of the market; it was hinted at this stage that the new car would be shorter than the average supermini but as spacious and practical inside as a large family car. The A-Class was first revealed to the motoring press late in 1996, and finally launched at the Frankfurt Motor Show in the autumn of 1997, the W168 A-Class was quite unusual for Mercedes-Benz featuring a front wheel drive layout and unusual tall but yet short body. One innovation of the W168 was a frontal-impact absorption system called the "Sandwich bar" (see patents DE4326 9 and DE4400132 in the name of Mercedes-Benz). In the event of a violent frontal impact, the engine and transmission would slide underneath the floor below the pedals rather than entering the passenger compartment. This was the first complete exterior designed by Coventry University trained Steve Mattin, for which he was named Autocar magazine's 'Designer of the Year'. Earlier, Mattin had mostly worked on design for the W210 E-Class in 1991. Concurrent to the W168, he designed the exterior of the W220 S-Class. The final design freeze occurred in January 1995, at 32 months before August 1997 start of production. The W168 became infamous in 1997 after flipping over during the traditional "elk test" performed by the Swedish automobile publication Teknikens Värld. According to the report, the W168 overturned when manoeuvring to avoid the "elk". Mercedes initially denied the problem, but then took the surprising step of recalling all units sold to date (2,600) and suspending sales for three months until the problem was solved by adding electronic stability control and modifying the suspension. The company spent DM 2.5 billion in developing the car, with a further DM 300 million to fix it. Between 1997 and 2004, 1.1 million first generation A-Class models had been sold. The A-Class was facelifted in 2001, with minor alterations to the headlights, front and rear bumper design and the addition of a new 170 mm (6.7 in) longer wheelbase version. It was launched at the Geneva Motor Show. All A-Class models are powered by four-cylinder engines, with 1.4 L and 1.6 L petrol models at launch (M 166 series), followed by two versions of a 1.7 L diesel engine (OM 668 series). In 1999, a larger 1.9 L petrol model was added, with the 2.1 the last W168 version to be launched in 2002. DaimlerChrysler invested EUR 900 million in developing the Rastatt plant where the A-Class is produced, and created 1600 new jobs (for a total of 4700). A further 600 people work in the office building at the plant site. Mercedes-Benz began W168 production on 17 February 1999 at its new Brazilian facility in Juiz de Fora, Minas Gerais. The Brazilian plant was the company's first factory in South America dedicated to passenger cars, with an investment of US$840 million and 10,000 employees. The factory initially produced A-Class and C-Class models, assembling them from pieces manufactured in Germany. The target for the cars was regional markets (from Argentina to Mexico) with modifications made to the cars to suit local conditions, like a protection for the motor base. On 15 August 2005 the factory stopped production of A-Class cars. The W169 is constructed with high-strength steel alloys with bonded joints. It has a large number of airbags including optional rear side airbags (for side-impacts in the backseats), optional side-curtain airbags, and standard head and thorax-protection side airbags. The front airbags are adaptive with two-stage gas generators operating according to the severity of accident. The force exerted by the seat belt system during a collision adapts dynamically depending upon the collision characteristics. The 'active' head restraints (standard for driver and front passenger) give enhanced protection from neck injury, especially during rear collisions. The angle of the A-pillar is flatter than the windshield angle. The cargo capacity of the W169 was increased by 15 percent compared with the W168. Seven types of motors are available, and all are four-cylinders: four petrol (gasoline) (A 150, A 170, A 200, A 200 Turbo) and three diesel (A 160 CDI, A 180 CDI, A 200 CDI) partnered with either five- or six-speed manual gearbox. A continuously variable transmission system called "Autotronic Constantly Variable Transmission" (CVT) is an optional feature. The petrol A 200 Turbo provides 193 hp (144 kW) and 280 N⋅m (207 lb⋅ft) of torque (rotational force); the diesel A200 CDI has 140 hp (104 kW) and 300 N⋅m (221 lb⋅ft). The most powerful model can take the car from a standstill to 100 km/h (62 mph) in 8.0 seconds, and has a top speed of 218 km/h (135 mph). The newly developed direct-injection CDI diesel units use a common-rail direct injection system that improves fuel consumption and reduces exhaust emissions and noise levels. All the engines meet the tight EU4 emissions limits. A particulate filter system is available as an option for the diesel units which reduces the particulate emissions by about 99% without the need for additives. The A-Class is a front wheel drive car and features traction control (ASR) as standard, as well as electronic stability control and anti-lock brakes (ABS). Handling is improved by precision tracking and anti-roll support, and by a Parabolic Rear Axle. A "Selective Damping System", in which the shock absorber forces respond differently according to conditions, is standard. For example, under normal conditions it operates at soft absorption; while cornering at speed it changes to full damping force. Sales of the W169 were targeted at 50,000 units in 2004. Dr. Joachim Schmidt, Executive Vice President Sales and Marketing, Mercedes Car Group, said that target had been reached even before vehicles arrived in dealer showrooms. It is a version of 5-door A-Class hydrogen fuel cell vehicle with 88 PS (65 kW; 87 hp) electric motor. It has a driving range of 160 km (99 mi). Three A-Class F-Cell cars were used in 2003 Frankfurt International Motor Show for press shuttle service. On June 18, 2004, 4 production F-Cell vehicles were delivered to Deutsche Telekom and BEWAG/Vattenfall Europe in Berlin. In 2007, the A-Class F-Cell were delivered to Landsvirkjun and Reykjavik Energy. A DHL version of F-Cell was unveiled in FC EXPO 2008. The W169 Model facelift changes included redesigned front and rear bumpers and lights, and stop-start function option on A 150 and 170 models. Active Park Assist enables the car to parallel park itself, with only throttle and brake inputs required from the driver. The five-door Saloon and the three-door Coupé vehicles were unveiled in spring 2008, alongside the refreshed 2009 M-Class and B-Class. Early models include A 160 CDI, A 180 CDI, A 200 CDI, A 150, A 170, A 200, A 200 TURBO. Japan models went on sale in 2008-08-20. Early models 5-door versions of A 170, A 170 Elegance. Japan models of A 170 was renamed to A 180 in 2009-08-24. It is a limited (5500 units) version for all model variants of the A-Class vehicles. It includes BlueEfficiency package, black radiator louvres, 16-inch titanium silver light-alloy wheels in a new 9-spoke design (tyre size 195/55 R16), a "Special Edition" badge on the mirror triangle, two-tone colour scheme in black and grey, Audio 20 radio with CD player and Bluetooth hands-free system and the Light and Sight package with a rain sensor, automatically dimming rear-view mirror, an illuminated vanity mirror in the sun visor, separately adjustable reading lights in the rear, a reading light for the driver and illuminated front foot wells, Seating Comfort package (height-adjustable front passenger seat, seat cushion angle adjustment and lumbar supports for the driver and front passenger). Standard exterior features also include fog lamps and a free choice of metallic paint finish. The Mercedes-Benz A-Class E-CELL was introduced in September 2010 and debuted at the October 2010 Paris Motor Show. The E-Cell has a range of 200 kilometres (120 mi) capable of developing a peak output of 70 kW (94 hp), a continuous power rating of 50 kW (67 hp) and a maximum torque of 290 N·m (214 lb·ft). The Mercedes A-Class E-Cell can accelerate from 0–60 km/h (37 mph) in 5.5 seconds, and its top speed is 150 km/h (93 mph). Tesla Motors, as part of its collaboration with Mercedes-Benz, built electric powertrain components for the E-Cell. The 36 kWh battery contains approximately 4,000 individual lithium-ion cells. Mercedes has developed a modular system for electric vehicles with battery and fuel-cell. This system allows the efficient use of shared parts in all the brand's electric vehicles. Thanks to the modular approach the electric drive of the A‑Class E‑Cell is also used in the B‑Class F‑Cell, and the energy storage units in the A‑Class EV are the same as the battery in the Smart fortwo electric drive. A limited production of 500 A-Class E-Cell electric cars will be built, for trial purposes, at the Mercedes Rastatt plant, near Stuttgart beginning in September 2010. As part of a demonstration program, the cars will be leased to selected customers in several European countries, including Germany, France, and the Netherlands. Daimler is not planning to sell the electric version outside Europe. It is a limited (300 units) version of 5-door right drive A 180 for Japan market. It included calcite white body colour, black interior colour, sport package (chrome exhaust tip, 17-inch 7-spoke alloy wheels, chrome iridium silver front grille, stainless acceleration and brake pedals with rubber stud, leather wrapped sport steering wheel and silver shift knob, silver meter panel), bi-xenon headlight and headlight washer, cornering lights, fog lamp (front/rear), rain sensor, sun visor with illuminating mirror, anti-glare mirror, 'Final Edition' emblem, floor mat with 'Final Edition' silver logo plate. The vehicle went on sale in 2012-05-28. As of December 4, 2006, 371,700 second generation A-Class model had been sold since September 2004, making a total of 1,500,000 A-Class produced at DaimlerChrysler's Rastatt plant in ten years. As of June 26, 2009, the 750,000th second generation A-Class vehicle was built at Rastatt plant. As of February 1, 2012, 1 million second generation A-Class model had been delivered since autumn 2004. The production version of the third generation of A-Class vehicles was based on the 2011 Concept A-Class, and was unveiled at the 2012 Geneva Motor Show, It has an entirely different design, and larger than the previous two generations of the A-Class, with a total length of 4,292 mm (169.0 in), making it a fully-fledged small family car for the first time. The vehicles were available in some markets from September 2012. Japan models went on sale in January 2013. The third generation A-Class is designed to be a direct competitor to the BMW 1 Series and Audi A3. It is intended to be more dynamic than its predecessor and is focused on younger owners. The Concept A-Class is a 3-door concept car that previewed the design of the third generation A-Class and was unveiled in 2011 New York Auto Show. It included M270 four-cylinder gasoline engine rated 211 PS (155 kW; 208 hp), radar-based collision warning system with adaptive brake assist, and exterior design language from Mercedes-Benz's F800 concept. Designed for the German RoadSense programme, the basic driving school package includes adaptation of the cockpit to accommodate the twin sets of pedals, a control switch in the centre console for driver's footwell illumination and warning signal for the twin sets of pedals, twin rearview mirrors, the Light and Sight package and the Seat Comfort package. The package is also part of the special A-Class "toBE" model, with deliveries from January 2013. The A 45 AMG is a performance version of the A-Class, fitted with a 2-litre four-cylinder turbo engine rated at 381 PS (280 kW; 376 hp) at 6000 rpm and 475 N⋅m (350 lbf⋅ft) at 2250-5000 rpm, AMG Speedshift DCT 7-speed sports transmission with Momentary M mode, 4MATIC all-wheel drive, 3-stage ESP with ESP Curve Dynamic Assist and "ESP Sport Handling" mode, AMG sports suspension with independently developed front and rear axles, high-performance braking system with 350 x 32 millimetres front brake discs and 330 x 22 millimetres rear brake discs, and is identifiable by the "twin blade" radiator grille, AMG light-alloy wheels in twin-spoke design and two square chrome-plated tailpipes. With 381 PS (280 kW; 376 hp), the A45 and its derivation vehicles, CLA45 and GLA45, have the highest specific output per litre of 187.5 horsepowers per litre for a four-cylinder motor in the passenger car as of September 2017. The Bugatti Chiron has the same specific output as A45. The vehicle was originally announced to be unveiled in first quarter of 2013, and was later unveiled at the Geneva Motor Show. Sales release date was set to 8 April 2013, with Germany market launch beginning in June 2013. The A-Class is powered by a range of 4-cylinder petrol and diesel engines, with the 1.5 diesel engines being versions of a Renault unit. Drive Kit Plus for iPhone, Mercedes-Benz phone module with Bluetooth, roof box 400 with Alustyle Quickfix carrier bars, Mercedes Sport product range (a spoiler lip for the front apron, a gleaming black radiator grill, gleaming black exterior mirror casing and waistline trim strip, a roof spoiler and rear apron trims with a diffuser look), light-alloy wheels were developed for the A-Class vehicles. The A-Class in Australia comes standard with 9 airbags. The phone module went on sale on 4th quarter 2012. Mercedes-Benz Sport products were produced for the A-Class (W 176) vehicles. As part of the A-Class launch, Mercedes-Benz started the 'A Rock' concert series with British alternative rock band Placebo. The 5-concert tour took place in Paris, Rome, Zurich, Hamburg, Madrid between June and July 2012. Production of A-Class began at Mercedes-Benz Rastatt plant in 2012. Mercedes-Benz signed an agreement with the Finnish supplier Valmet Automotive to expand A-Class vehicle production, where Valmet will produce more than 100,000 units for Daimler from 2013 through 2016, the agreement was later continued to cover the rest of the production time of the third version which came to an end when production of the fourth version began in 2018. In 2017 Mercedes-Benz signed a new agreement with the Finnish supplier for the fourth version. Production of A-series BlueDirect 4-cylinder engines took place at Mercedes-Benz engine production plant in Kölleda. The W177 Mercedes-Benz A-Class is the fourth and current generation of the A-Class range of subcompact executive hatchbacks. It was launched in 2018 as the successor to the W176 Mercedes-Benz A-Class and sales commenced on March 2018. It is available as a 5-door hatchback (W177 model code), as a 4-door sedan (V177), and as a long-wheelbase sedan exclusive to China (Z177). The fourth generation A-Class hatchback was unveiled to media in February 2018 in Amsterdam ahead of its public debut at the 2018 Geneva Motor Show. At launch Mercedes-Benz revealed the vehicle's "predator face", which is also implemented in the C257 CLS and C118 CLA, will not spread throughout the brand's entire range of cars. ^ "Upcoming A class in the US". ^ "Aerodynamic New A-Class Sedan". pressreader.com. Retrieved 2018-10-15. ^ "The Baby Benz: the 201 series (1982 - 1993)". Daimler Global Media Site. Retrieved 9 December 2018. ^ "Merc's baby to be made wider". Irish Independent. 19 December 1997. Retrieved 2 April 2013. ^ ANDREWS, EDMUND (11 December 1997). "Mercedes-Benz Tries to Put a Persistent Moose Problem to Rest". New York Times. Retrieved 2 April 2013. ^ "Mercedes bends". The Economist. 13 November 1997. Retrieved 2 April 2013. ^ a b "Rastatt Plant celebrates production of 1,500,000th Mercedes-Benz A-Class". Media.daimler.com. 4 December 2006. Retrieved 7 July 2012. ^ "Mercedes-Benz A-class". Car and Driver. Feb 2001. Retrieved 2 April 2013. ^ "The Mercedes-Benz A-Class: A class apart". Mercedes-Benz. 28 September 2007. Retrieved 2 April 2013. ^ "Mercedes Benz A Class | Euro NCAP – For safer cars crash test safety rating". Euro NCAP. Retrieved 21 November 2012. ^ "Profile". Thonburi Automotive Group – Thonburi Phanich. Archived from the original on 21 February 2014. Retrieved 30 April 2013. ^ "A-Class Special Edition 2009: Excitingly sensible, sporty and attractive". Media.daimler.com. 23 April 2009. Retrieved 7 July 2012. ^ a b c d e "Mercedes-Benz Introduces the Battery-Powered A-Class E-CELL; Production Run of 500". Green Car Congress. 15 September 2010. Retrieved 4 May 2011. ^ Nino Marchetti (2 October 2010). "Mercedes A-Class E-Cell EV Hits Paris". Earth Techling. Retrieved 4 May 2011. ^ a b c Eric Loveday (16 September 2010). "Mercedes-Benz unveils the limited production A-Class E-Cell electric vehicle". AutoblogGreen. Retrieved 4 May 2011. ^ "Electric Mercedes A-Class to Debut at Paris Auto Show Using Tesla Battery Tech – Benzworld.org – Mercedes-Benz Discussion Forum". Benzworld.org. Retrieved 3 October 2010. ^ Jim Motavalli (26 August 2010). "Mercedes-Benz to Produce 500 E-Cell A-Class Electric Cars". The New York Times. Retrieved 4 May 2011. ^ Laurent J. Masson (29 March 2011). "Quick Drive: Electric Mercedes A-Class E-Cell". PluginCars.com. Retrieved 4 May 2011. ^ "Production milestones at Rastatt plant: Mercedes-Benz delivers 500,000th B-Class and 750,000th A-Class". Media.daimler.com. 26 June 2009. Retrieved 7 July 2012. ^ "More than One Million A-Class Models of the Current Generation Delivered to Customers". Media.daimler.com. 1 February 2012. Retrieved 7 July 2012. ^ "Kecskemét, Mercedes-Benz Werk | Daimler > Unternehmen > Daimler weltweit > Europa". Daimler. Archived from the original on 22 June 2010. Retrieved 26 September 2010. ^ "Valmet Automotive to manufacture the new Mercedes Benz A-Class in Finland". Valmet Automotive. Retrieved 24 July 2012. ^ "Mercedes Expecting to Join Nissan in New Mexican Assembly Complex". TheDetroitBureau.com. 26 January 2012. Retrieved 12 September 2012. ^ "14 New Cars That Make Crazy Horsepower Per Liter". Road & Track. 19 September 2017. ^ "AMG vehicles pose for family portrait to celebrate 45-year anniversary, tease future". Autoblog. 18 June 2012. ^ "Mercedes-Benz A45 AMG is Affalterbach's first big leap into the little pond". Autoblog. 5 March 2013. ^ "New Mercedes A-Class details". ^ "How to spec a Mercedes-Benz A-Class". What Car?. 5 November 2012. Retrieved 16 September 2014. ^ "The development of the Mercedes-Benz A-Class: The drive system – The petrol engines: Powerful, responsive and super-clean". Media.daimler.com. 14 May 2012. Retrieved 7 July 2012. 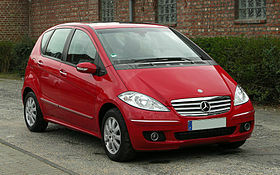 ^ "The development of the Mercedes-Benz A-Class: The drive system – The diesel engines: Economy right across the board". Media.daimler.com. 14 May 2012. Retrieved 7 July 2012. ^ "The development of the Mercedes-Benz A-Class: The drive system – The 7G-DCT dual clutch transmission: Dynamic and efficient". Media.daimler.com. 14 May 2012. Retrieved 7 July 2012. ^ "New Mercedes A-class (2018): 'L' saloon revealed in China". CAR Magazine. Retrieved 2018-06-12. ^ "Mercedes A-Class Sedan Caught On Camera Ahead 2018 Launch". Motor1.com. Retrieved 2018-06-12. ^ "Z177 Mercedes-Benz A-Class L Sedan revealed in Beijing - alternate version for other markets in H2 2018". Paul Tan's Automotive News. 2018-04-24. Retrieved 2018-06-12.